COLUMBIA, Md., July 10, 2018 /PRNewswire/ -- Global performance improvement solutions provider GP Strategies Corporation and Fortune Global 500 petroleum company Ecopetrol recently celebrated 10 years of partnership at GP Strategies' Center of Excellence in Bogotá, Colombia. 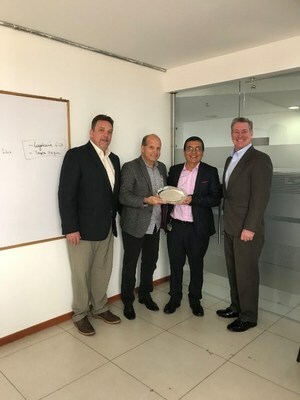 During the celebration, Eric Rodgers, GP Strategies' Senior Vice President for Engineering and Technical Services; Doug Robey, Vice President of GP Strategies; and Jorge Trespalacios, GP Strategies' Colombia Account Manager, presented an engraved silver platter to Ezequiel Acosta, Ecopetrol University Director, to recognize the strong and long-tenured relationship. "It was a great day celebrating our relationship, and it was a gift to show our appreciation and gratitude to Ecopetrol on a great 10 years," Rodgers said. "At Ecopetrol, we consider GP Strategies a great ally, helping us achieve our goal of securing knowledge in our organization," Acosta added. Over the last decade, GP has supported Ecopetrol in a variety of capacities, including operational excellence (OE), competency mapping, operational readiness, documentation support, technical training, maintenance excellence, operator training, organizational change, and certification programs. Ecopetrol credits the implementation of an OE program that has made a positive change in the operators. "OE developed certain analytic skills in operations personnel as well as a greater focus on process costs and product quality, with favorable economic results for the company," Acosta said. "Today we can say that there are fewer process deviations and a better related response time. "Additionally, OE has had an impact on the Key Performance Indicators. This has made it possible for Ecopetrol to achieve the return on investment for the program in a short period of time." GP Strategies operates a Center of Excellence (COE) for Technical Services in the World Trade Center in Bogotá, Colombia, to support global Energy clients and strengthen GP Strategies' presence in South America. This office provides access to resources, technology, and solutions to help customers ensure their businesses are effectively responding to the significant changes impacting the industry. The COE brings together a team of engineers, software developers, and learning professionals focused on delivering a new generation of products and services that will help clients achieve their strategic business objectives. Ecopetrol S. A. is headquartered in Bogotá, Colombia, and engages in the exploration, development, and production of crude oil and natural gas. It operates its business through three segments: Exploration & Production, Refining & Petrochemicals, and Transportation & Logistics. Additional Information can be found at https://www.ecopetrol.com.co.